may be available for your next special event! For more than 25 years, The Fabulous Thunderbirds have been the quintessential American band. The group's distinctive and powerful sound, influenced by a diversity of musical styles, manifested itself into a unique musical hybrid via such barn-burners as "Tuff Enuff" and "Wrap It Up." 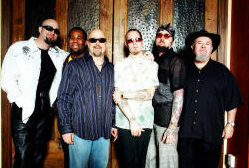 Co-founder Kim Wilson, the sole original member, still spearheads the group as it evolves into its newest incarnation. "We started as a straight blues band," vocalist and harmonica player Wilson says. "We now incorporate a mixture of a lot of different styles. We're an American music band and we're much higher energy than we were before." The thread though-out the T-Birds career has been the respect the group has commanded for its peerless musicianship and devotion to the sounds of blues, R&B and rock and roll. In fact, Muddy Waters called Wilson his favorite harmonica player and vocalist. "Muddy Watters was very good to me," Wilson says. "He almost adopted me. I'll never forget him." In 1979, The Fabulous Thunderbirds released their first self-tiled album. Primarily blues influenced, it became a cult classic. "Things were wide open back then," Wilson recalls. "There were hundreds of stages where bands could show what they had." In subsequent releases, the band started to incorporate more Cajun, rock and roll and soul influences. The album "T-Bird Rhythm" marked a creative turning point for the group as it collaborated with noted producer Nick Lowe. In 1986, The Fabulous Thunderbirds reached a commercial peak with the album, "Tuff Enuff." The single of the same title, as well as the singles "Wrap It Up" and "Look At That," all went Top 40. The song, "Tuff Enuff" was featured in the film, "Gung Ho," starring Michael Keaton. "The thing about the T-Birds is that we can play both blues festivals and rock venues," Wilson comments. "We're a diversified band now and everyone's on the same page. This is a great time for this band. We're looking forward to the future." The Fabulous Thunderbirds featuring Kim Wilson may be available for your next special event! booking entertainment, such as major name entertainers or celebrities, booking The Fabulous Thunderbirds, booking information on The Fabulous Thunderbirds, or hiring The Fabulous Thunderbirds for your special event, or to book or hire The Fabulous Thunderbirds, or if you are seeking The Fabulous Thunderbirds booking agent for corporate entertainment or for a private party. Consider the opportunity to book The Fabulous Thunderbirds or other entertainers for a wedding, birthday, anniversary, business meeting or convention. If you are not a talent buyer, we are unable to provide The Fabulous Thunderbirds manager or management contact information. Consider this your official The Fabulous Thunderbirds booking agency web site – The booking agent who works for you! This company acts as an entertainment consultant or broker/producer and does not claim or represent itself as the exclusive agent, representative or management of The Fabulous Thunderbirds. 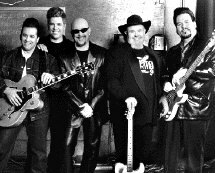 The Fabulous Thunderbirds, blues music artists - booking agent. This group may be available for your event. Book them if you can. You will have the time of your life!